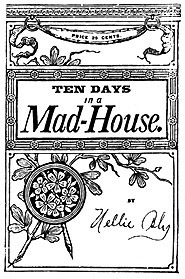 Ten Days in a Mad-House is a book by American journalist Nellie Bly. It was initially published as a series of articles for the New York World; Bly later compiled the articles into a book, being published by Ian L. Munro in New York City in 1887. The book was based on articles written while Bly was on an undercover assignment for the New York World, feigning insanity at a women's boarding house, so as to be involuntarily committed to an insane asylum. She then investigated the reports of brutality and neglect at the Women's Lunatic Asylum on Blackwell's Island. The book received acclaim from critics at the time. Accumulation of her reportage and the release of her content brought her fame and led to a grand jury investigation and financial increase in the Department of Public Charities and Corrections. Bly left the Pittsburgh Dispatch in 1887 for New York City. Penniless after four months, she talked her way into the offices of Joseph Pulitzer's newspaper the New York World, and took an undercover assignment for which she agreed to feign insanity to investigate reports of brutality and neglect at the Women's Lunatic Asylum on Blackwell's Island. After a night spent practicing expressions in front of a mirror, she checked into a boardinghouse. She refused to go to bed, telling the boarders that she was afraid of them and that they looked "crazy." They soon decided that she was "crazy," and the next morning summoned the police. Taken to a courtroom, she claimed to have amnesia. The judge concluded she had been drugged. Several doctors then examined her; all declared her insane. "Positively demented," said one, "I consider it a hopeless case. She needs to be put where someone will take care of her." The head of the insane pavilion at Bellevue Hospital pronounced her "undoubtedly insane". The case of the "pretty crazy girl" attracted media attention: "Who Is This Insane Girl?" asked the New York Sun. The New York Times wrote of the "mysterious waif" with the "wild, haunted look in her eyes" and her desperate cry: "I can't remember I can't remember." "My teeth chattered and my limbs were goose-fleshed and blue with cold. Suddenly I got, one after the other, three buckets of water over my head—ice-cold water, too—into my eyes, my ears, my nose and my mouth." After ten days, the asylum released Bly at The World's behest. Her report, published in The World and later released as a book, caused a sensation and brought her lasting fame. The question in hand was how Nellie managed to convince professionals of her insanity in the first place. As revealed in her first hand account, "Ten Days in a Madhouse", Nellie spoke on how the main physician that performed her examination was more focused on the attractive nurse that was assisting the examination than with Nellie herself. While physicians and staff worked to explain how she had deceived so many professionals, Bly's report prompted a grand jury to launch its own investigation with Bly assisting. The jury's report resulted in an $850,000 increase in the budget of the Department of Public Charities and Corrections. The grand jury also ensured that future examinations were more thorough such that only the seriously ill were committed to the asylum. An independent film version of 10 Days in a Madhouse, written and directed by Timothy Hines, starring Caroline Barry, Christopher Lambert, Kelly Le Brock and Julia Chantrey, was released in 2015 from Pendragon Pictures. On January 19, 2019, Lifetime debuted a movie called Escaping the Madhouse: The Nellie Bly Story which stars Christina Ricci as Nellie Bly, Judith Light as Matron Grady, and Josh Bowman as Dr. Josiah. “American Horror Story: Asylum” was vaguely based on Ten Days in a Madhouse. In September 2017, a TV series was announced based on 10 Days in a Madhouse, written by Sarah Thorp, starring Kate Mara as Bly, executive produced by Mara, Thorp, and Carolyn Newman for Entertainment One, Danjaq and The Frederick Zollo Company. In March 2018, a stage version of Ten Days in a Madhouse written and directed by Tony Vezner was produced at Concordia University in Irvine, California. ^ Bill DeMain. "Ten Days in a Madhouse: The Woman Who Got Herself Committed". mental floss. Retrieved 2013-04-23. ^ a b TIME Staff (2009-04-12). "Top 10 Literary Stunts". Time. Retrieved 2013-04-23. ^ "Nellie Bly's Lessons in Writing What You Want To". The New Yorker. Retrieved 2017-08-23. ^ a b Bly 1887. ^ Kroeger, Brooke (1994). Nellie Bly: Daredevil, Reporter, Feminist. pp. 91–92. ^ "IN AND ABOUT THE CITY; A MYSTERIOUS WAIF. BELLEVUE SHELTERS A GIRL OF WHOM NOTHING IS KNOWN.". The New York Times. September 26, 1887. ^ "In and About the City: A Mysterious Waif". Undercover Reporting. New York University. Retrieved January 9, 2018. ^ "Ten Days in a Mad-House". digital.library.upenn.edu. Retrieved 2018-10-13. ^ 10 Days in a Mad House, IMDb page. ^ 10 Days in a Mad House official website. ^ Patrick Gomez. "Escape from the Madhouse: The Nellie Bly Story first look". EW.com. Retrieved 2019-01-19. ^ Andreeva, Nellie (5 September 2017). "Kate Mara To Topline Nellie Bly Drama Series Project For eOne & Bond Producers". Deadline. Retrieved 20 April 2019. Wikimedia Commons has media related to Ten Days in a Mad-House. Nellie Bly (1887). Ten Days in a Mad-House. New York: Ian L. Munro. Published with "Miscellaneous Sketches: Trying to be a Servant", and "Nellie Bly as a White Slave". This page was last edited on 22 April 2019, at 04:55 (UTC).